This is a mantra of mine that I stole more than 3 decades ago from one of the most gifted martial artists I've ever known, a guy called Ross Frame. Ross was born in my hometown of Blantyre Scotland and started JKA Karate at the same time as me. He was light years ahead of the curve and I say that knowing full well that my capacity to recognise brilliance at that time was a lot less than it is today. Even as a boy Ross’ knowledge of this caper was encyclopedic, his physical delivery astounding and his insights so profound they seemed to come from another place. Everything he said and did back then has stood the test of time - and I’m a harsh judge. Despite having the wisdom of a person 3 times is age, Ross’ thing wasn’t talking, it was training. He trained like a man possessed - all the time - at a time when if you trained more than twice a week you really stood out. His dojo was the famous Glasgow Budokan, a place full of talented and successful peers which was the benchmark for shotokan karate in Great Britain in the 1970’s and 80’. Despite being an authority on not only karate but just about every martial art, he was painfully quiet and very self effacing. He rarely opened up but when he did, the conversation was one to remember - and what came out of his mouth was embodied in his ability - he literally kicked and punched the talk..! 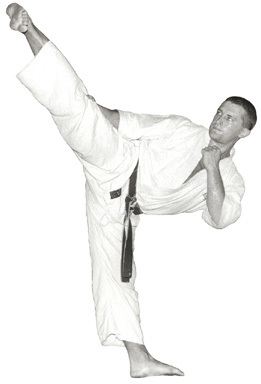 With shotokan as his backdrop he went looking for anything that would improve his ability, studying the pros and cons of contact, groundwork, holds and chokes as well as better ways to strike, kick, punch, parry and block. This was a guy who was already highly gifted in every element of standard shotokan. His kihon waza and kata were masterful and his kumite fast, clean and very effective - just ask me! The point of this is that Ross didn’t ignore the barriers to progress, he just didn’t see them. Limitations based on single-mindedness is an arrow often aimed at karate; karate isn’t real, karate people can’t grapple, karate is OK from a metre out, karateka don’t train enough, you’ll easily beat a karate man if you take him down bla bla. All this is true of course, but it is also true of any fighting method (whether it propagates non-violence or not) if people are closed to improvement based on hard experience. To say that karate as a whole or any individual karateka can or can’t do this or that is just stupid. There’s as much talk and action around fight scenarios, tactics, adapting to environments embracing other methods etc. etc. going on in karate circles as there is in any MMA stable - maybe more. There also happens to be a helluva lot of very hard working street-capable people doing karate. Saying that every karateka is a one-trick pony is just as flawed as saying every UFC fighter is a perfectly rounded devastating ‘fighter’. All ‘methods’ demand compliance, even compliance to ‘non-compliance’ is another form of compliance. Karate might only appear to give you a hammer, but your toolbox should be packed full of other tools including an understanding of karate’s attributes beyond the physical, but that’s another story. I trained with Ross in Glasgow in the eighties in Blantyre and G.S.A. Superb karateka, very talented and ahead of his time. Ross had a great understanding of MMA and used to mix styles and incorporate those to his training. Taekwondo kicks, boxing strikes, jiu-jitsu locks, Kyokushinkai techniques. Great classes in Blantyre on tatami. VB. Karate, an Asian martial artwork that originated in Okinawa within the early a part of the twentieth century, has spread for the duration of the world. Now not extraordinarily, as the artwork grew, variants in system grew as good. Karate is an art which needs years of continuous practice and need a lot of attention while learning this art. Best demonstrated essay writing service related writers have shown their content with picture and have also revealed the secrets of how to learn this art.? I'm a guest to this forum but as someone who has trained with Ross Frame for the last 28 years, and I'm still going, I can fully agree to what has been said. Ross's strength is in the fact he continues to question both himself and the martial arts around him. Many know him as a superb Karateka but few realise that his grappling skill are just as awesome . I should know as the old saying goes, I have the bruises to show it and anticipate to get more tomorrow night! He is always pushing himself and those he trains and questions them "lets do another 10" "can you do a handstand press up (Yip he does them)"
I am glad to say I have trained with him and call him Sensei!